I had great plans for this page of our travels. But again, The best-laid schemes o’ mice an’ men Gang aft agley. I took lots of pictures of Budapest; buildings, statues, a castle, bridges, parks, a food fair and us in a spa that dated back to the 16th C. I put the camera chip in the computer, renamed each picture and then took the chip and put it back in the camera and formatted it. WITHOUT TRANSFERRING THE PICTURES!!! So we had a great time in Budapest. We took the first day and did maintenance, laundry and small bike things. The campground was at one end of a bus line and the castle was at the other, very simple. So on the second day we took the bus and walked up the hill to the castle, along its parapet looking out over Pest. (Budapest is actually two cities, Buda on the hilly west bank of the river and flat Pest on the east side.) We walked out the other end of the castle after sampling the tourist shops and buying some more table linens. Then along the river to a bridge and over to Pest. We walked the pedestrian streets and had a late lunch. Then back to camp. The third day we rode the bus and the metro (subway) to Pest's major park and found our way into the spa. 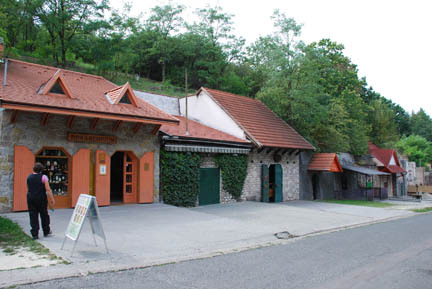 Buda and Pest sit on major hot springs and have had spas here since Roman times. This one was originally built during the Ottoman occupation but was last remodeled during the 1700's. It had statues around the main pool area and decorative moldings and busts in the hot pool rooms. There were at least a dozen hot pools of a variety of temperatures. The main swimming pools were outside with lots of area to sunbathe. There were fountains and a circular area, enclosed by a wall, and then there was a second circular wall (sort of like a bull's eye target) that formed a ring. And at every half hour there would be jets of water that made the ring of water circle quickly. Getting into it one was whisked around the ring without effort, except to try and not bump into too many people. After a few hours trying out all the waters we got dressed and went wandering through the park. We followed a trail around a lake and came on a food fair. There were lots of booths of foods and wines and even a few handicrafts. We got an Hungarian cookbook, for free, and sampled some liquor. We had had lunch at a roadside stand as we left the spa and weren't hungry (not hungry in Hungary??) so we skipped the food. Like our US food fairs the booths charged money to eat the foods offered, although some had sample bits to taste and tempt you into a purchase. 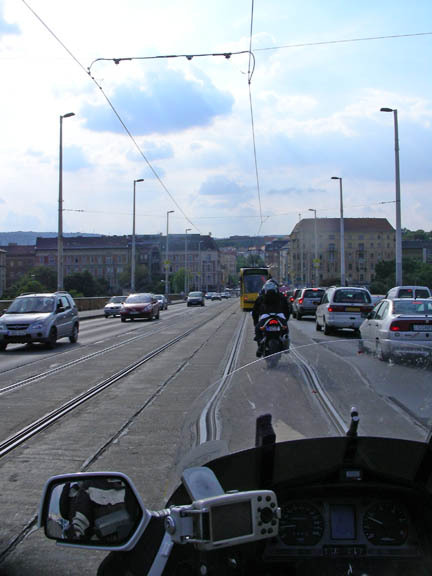 Kathy's pictures did not get lost and here is a picture of us running down the trolley tracks behind a local motorcyclist as we arrived in Budapest. We are passing strings of stopped traffic because it is rush hour. Even without that assistance European cities are packed with cars and traffic is always a mess. European cities were built in the day of horse carts and walking and don't handle well today's demands of trolleys, cars, trucks and buses without the addition of motorcycles and scooters. 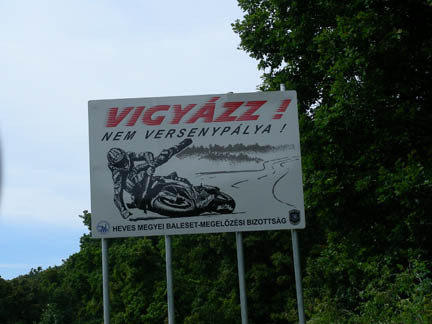 From there we went to the Magyar Route 66 motorcycle campground. We took this road because it looked interesting on the map. Evidently it is very popular with motorcyclists and after riding it we agree with that idea. Too bad some of them take it too fast. This road led to the town of Eger where there is the Szépasszony völgy. This translates as the "Valley of Beautiful Women". 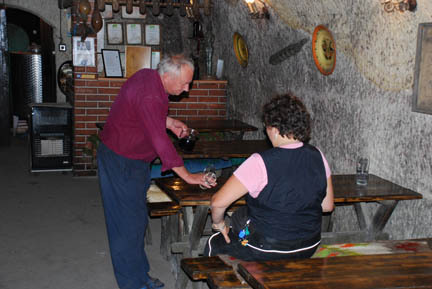 It is a small valley with small caves cut into the hillsides that were used to make and store wine. Today the caves are still there but the tourists are too and they cater to them. 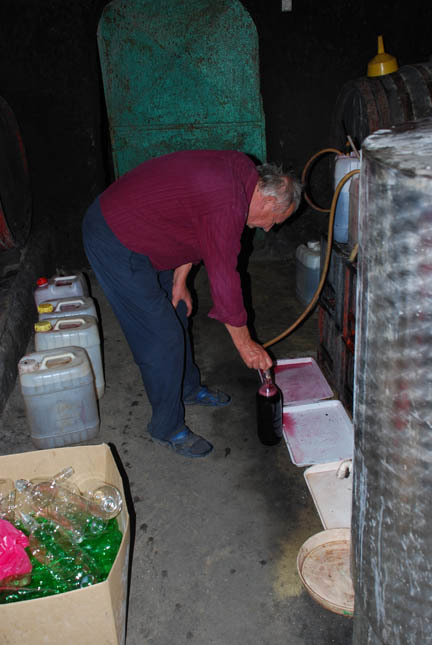 We sampled a couple of his wines. And bought some. Which he then proceeded to fill the plastic 2 liter bottle in the back room. It was a drinking today wine, not one to put up for the future!